To follow the story from the beginning, click here. A few posts ago I mentioned that from mid September I would be back in the blogging game, with more time to focus on 60 Postcards. I am back for good (Take That reference totally intended). I have decided to take some leave from work to delve into my 60 Postcards world – to explore London town (with a potential a return to Paris too) – taking it all in, finding the best places to write and embracing a different challenge for a while. To say that I am excited is quite the understatement. It was my first day yesterday and I am easing myself into it – I kept to my local Kings Cross hood. Caroline (who has recently embarked on her new life as an actor), joined me for some coffee and lunch – a good old catch up we had, amongst times of silence – learning lines for her, writing for me. A perfect day. I have decided that whilst I am off – I am also going to be an unofficial PR rep for Kings Cross, ha. Seriously – you need to visit if you haven’t for a while. 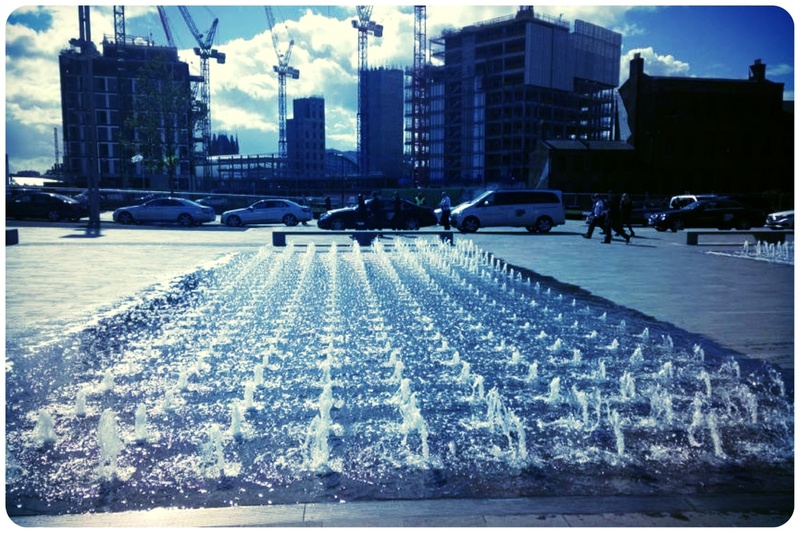 Granary Square is a gorgeous open space with spectacular fountains (lit up at night in a choreographed routine) – which is home to Central St Martins Art College and two of my favourite restaurant/bars, Caravan and Grain Store. Daisy Lowe, English fashion model, sat down behind us at lunch in her perfect lace dress. I looked down at my outfit and felt immediately annoyed that I hadn’t put on something a little more smart. Or quirky. I suppose it was at least an improvement on last week where I managed to get to work and be sat at my desk for half an hour before I was told that I had my top on inside out. Along with Daisy, a number of lip-stick wearing, long-legged, uber-cool beauties rushed into the restaurant for a bite. It didn’t take us long to realise that Fashion Week was hitting our lunch. Perhaps I should have gone for the salad option after all? Nah. Outside in the square we saw a flurry of photographers papping away at fashonistas. Fashonistas that I probably should have recognised. Friend Inaki was on call to inspect my photo and has informed me that the fella in the photo montage below (the two photos on the right) is Justin O’Shea – the Style and Buying Director of MyTheresa.com. A little reminder that I need to get up to speed on these things. It was time to move on and I knew the perfect place (introduced to me by a new friend). The Booking Office Bar in the Renaissance Hotel is the perfect spot for a coffee or a cocktail. I find myself gazing out of the window there as it looks over onto the platform where people return from their Paris trips. I gaze for a little too long when I see people reunited. It’s fascinating! (Creep alert). But I think this may just be a perfect place for me to write. Now, you know I love a good story from abroad. Phil is a friend from school, who I keep in touch with on Facebook to hear about his utterly amazing job (and I bore him with my 60 Postcards chat, of course). Given that musicals have become a theme, Phil is the perfect person to get involved as he is part of the touring cast of Stomp. 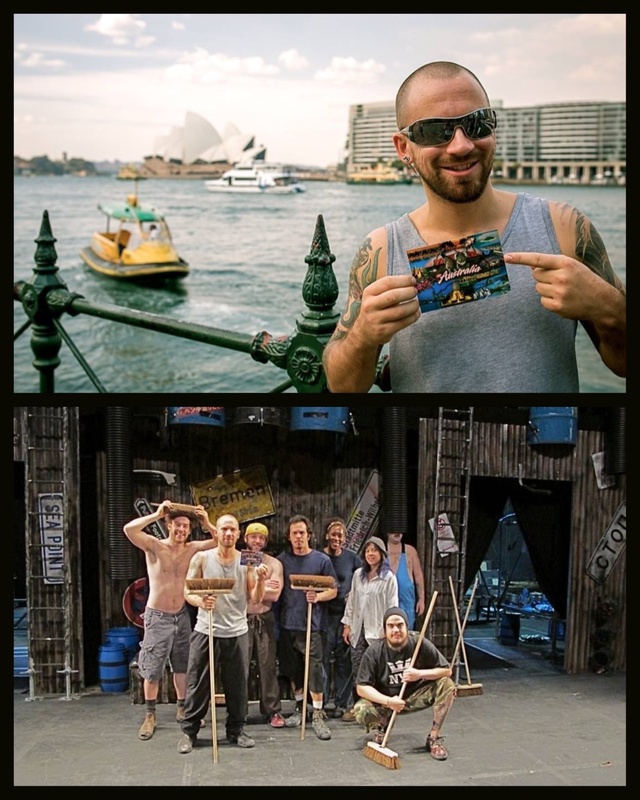 They have just been at the Theatre Royal, Australia, and Phil sent the following shots of him with a postcard in front of the Sydney Opera House and the cast on stage. Thanks to Phil and the group for the photos. I look forward to seeing him soon for a catch up on his next stop in the UK! A couple of nights ago I went to see the new Richard Curtis film – About Time. Prepare to laugh, prepare to cry and prepare for it to make you think. It devastated me in some ways and absolutely enlightened me in others. I don’t want to give too much away but if you get a chance, I recommend that you take a look. If only we could all time travel…. It’s good to be back – I will be blogging later in the week from Dorset. It is time to visit the family. I cannot wait. So thrilled to hear that you are doing this sabbatical to spend your time writing and developing your ’60 postcards’ ideas – fantastic! Your mum would be so proud, as we all are, of your achievements. 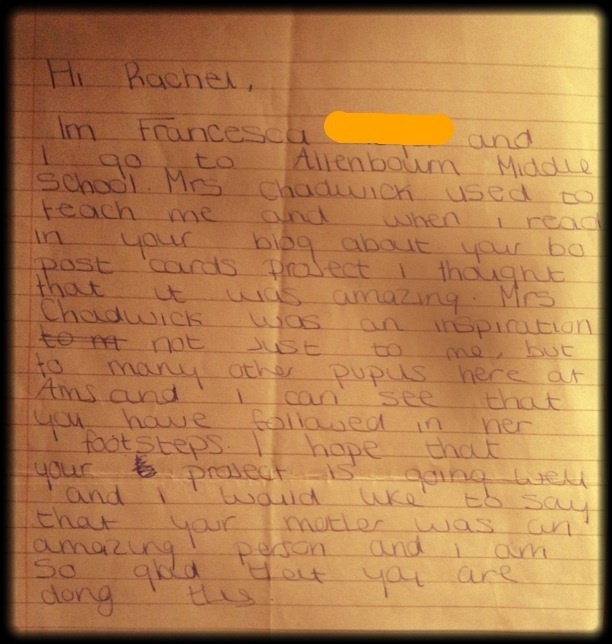 Just goes to show what an inspiration your mum was and still is. Ps: we think your dad is pretty good too!!! 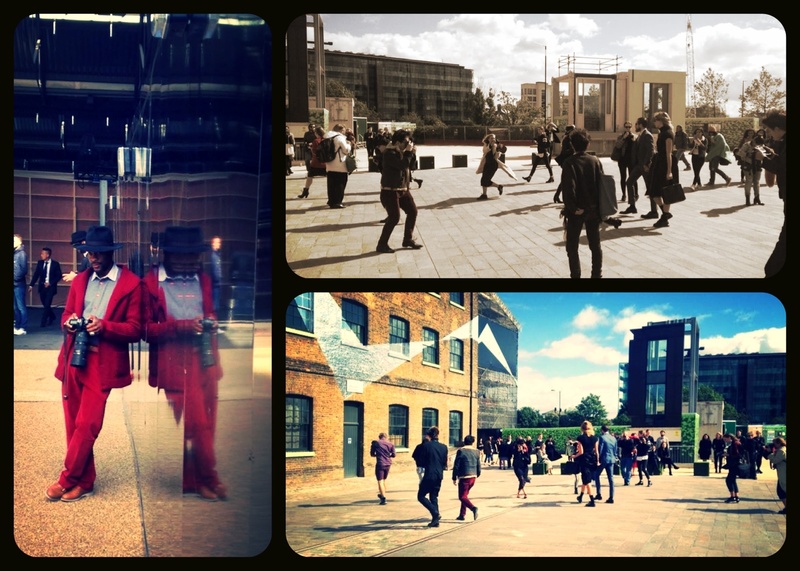 Granary Sq and the Booking Office bar are two of my favourite places in London! Good luck and enjoy the sabbatical! I know how hard you will continue to work!